Get ready to go bananas with this appeelin' Banana Mystery Box! Split open these boxes to find banana monkeys, parrots, clothing, trinkets, ships, chromas, or tan familiars frolickin’ about. Dive in and ye may also capture banana sea turtles and seals swimmin’ around in the leftover peels. Don’t slip-up and forget to partake in the side-splitting banana fun. 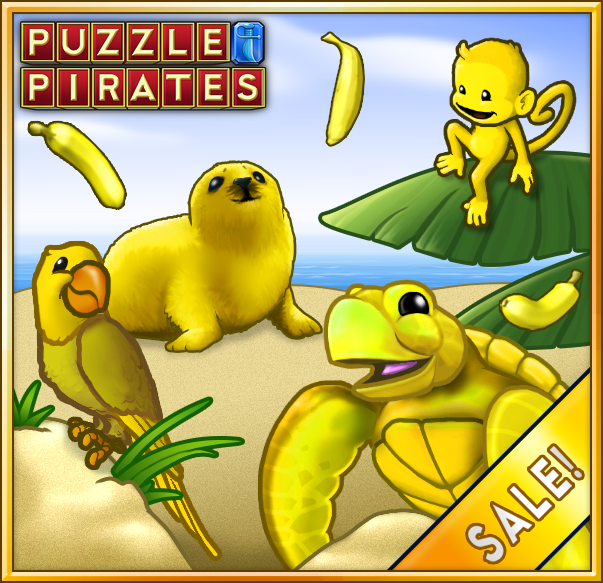 From now until 3:00 PM PDT on May 21, 2018 you'll receive a free Banana Mystery Box for every $9.99 you spend on doubloons, or every month of subscription time you purchase! Fer more information about the full contents of the 2018 Banana Mystery Box, as well as the official rules, please click here. The Banana Mystery Boxes are only available fer a limited time, so grab 'em before they split!